I have been head of the Paediatric Pulmonology Unit at SJD Barcelona Children’s Hospital since 2008 and coordinator of cystic fibrosis care since 2012. At the Hospital, I am also part of the multidisciplinary home mechanical ventilation team, the airway team, and the teams for comprehensive treatment of the neuromuscular patient and obstructive sleep apnea hypopnea syndrome. 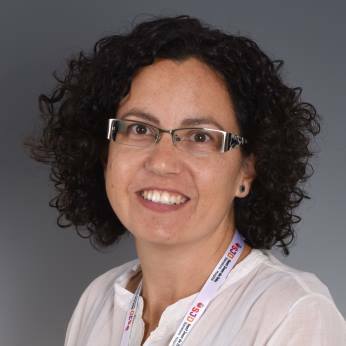 I am also an active member in several associations, such as the Spanish Society of Paediatric Pulmonology (SENP) and the European Cystic Fibrosis Society, and collaborate in various working groups in order to continuously improve patient care. Subspecialisation in Paediatric Pulmonology from the Spanish Society of Paediatric Pulmonology (SENP) and the Spanish Paediatric Association (AEP), 2015. Training residency in the Paediatric Pulmonology and Cystic Fibrosis Unit. Hospital Vall de Hebrón, 2005. Specialist in Paediatrics and its specific areas, 2003. Bachelor’s degree in Medicine and Surgery from the Autonomous Universitat de Barcelona, 1998. Outstanding Honours Award, 1999. Training residency in the Pulmonary Division of Boston Children’s Hospital - Harvard Medical School, Boston, 2006. Cols Roig M. Practical aspects of non-invasive home ventilation in children. In: Medina A., Pons-Òdena M., Martinón-Torres F. Non-invasive ventilation in pediatrics. 3rd edition. Barcelona: Ergon (2015): 161-72. Cols Roig M., del Campo García-Ramos E. Manejo de las complicaciones respiratorias. In: Febrer Rotger A. Rehabilitación de las enfermedades neuromusculares en la infancia. Madrid: Ed. Médica Panamericana SA (2015). Working group for the report on Ivacaftor (Kalydeco®) for the treatment of cystic fibrosis. Barcelona: Agència de Qualitat i Avaluació Sanitàries de Catalunya. Departament de Salut. Generalitat de Catalunya, 2015. De Dios-Caballero J., del Campo R., Royuela A., Solé A., Máiz L., Olveira C. et al. Bronchopulmonary infection–colonization patterns in Spanish cystic fibrosis patients: Results from a national multicenter study, Cyst Fibros J.. 2015 Sep 28. pii: S1569-1993 (15) 00212-X. doi: 10.1016/j.jcf.2015.09.004. Collaboration on the European guidelines for monitoring CFSPID (Delphi method) published in: Munck A., Mayell S.J., Winters V., Shawcross A., Derichs N., Parad R. et al . Cystic Fibrosis Screen Positive, Inconclusive Diagnosis (CFSPID): A new designation and management recommendations for infants with an inconclusive diagnosis following newborn screening. J. Cyst Fibros. 2015 Jan 24. pii: S1569-1993(15)00003-X. doi: 10.1016/j.jcf.2015.01.001. I am also part of the working group that developed the Funny Friends virtual respiratory physiotherapy incentive system, which was granted an award by the 4th edition of the Vodafone Awards for Innovation in Telecommunications in 2010, and the Novartis Hinnovar Prize in 2011. Tutor of paediatric residents at SJD Barcelona Children’s Hospital, since 2011. Member of the Local Teaching Committee: spokesperson and paediatric tutor coordinator, since 2011. Head of teaching in the Paediatric Pulmonology Unit, since 2008.